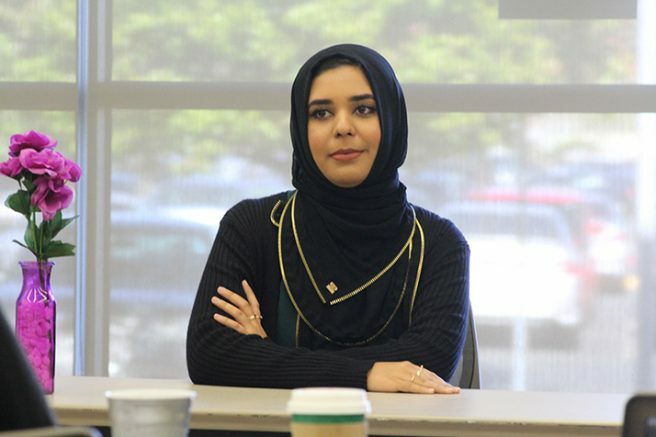 The Muslim Student Association (MSA) collaborated with UNITE to host an event titled “Hello I am Muslim,” on Wednesday. The event was hosted in the Student Center Community rooms one and two. Many came out to fill the room and see the event. MSA President Muhammad Tahir Shahbaz said that he was pleased and surprised by the turnout. “This is not about Islamophobia, this is about celebrating the beauty and complexities of being Muslim” said President Tahir Shahbaz. The event started out by showing a video about what it was like to be a Muslim student. Then three panelists came up and a discussion about Islam began. The panelists included two ARC Muslim students, Gamar Alizani, and Momna Shabaz. The third panelist was an ARC humanities professor William Lester. “Having knowledge about different religions is so important” said Lester. One topic that came out of the event was the Hijab and how some of the panelist felt about it. For the uninformed, the Hijab is a religious code where women of the Islamic faith wear a scarf that covers their hair and neck. This topic came up during the question and answer portion of the event where an audience member asked how the panelists felt about others saying that the hijab is oppressive. “The hijab frees me” said Momna Shahbaz. Momna said that she felt that hijab made it so she didn’t have to follow America’s beauty standards. The other panelist, Alizani, echoed this, she said that she wanted to be able to be herself without worrying about what others think of how she looked and the hijab allows this. “My hijab is my devotion to my religion. It’s about humbleness” said Alizani. The event ended with a poem read and written by Alizani. The MSA then gave out roses to the audience members to spread love and peace. The MSA meets every second and fourth Friday of the every month from 11 a.m. to 12 p.m. in Davies Hall room 201. Anyone is welcome to join the club. 1 Comment on "Muslim Student Association celebrates Islam"
The person who devotes their entire life and every day devoted to a religion is telling nonMuslims, “It’s important to have knowledge of different religions”? Most Muslims I’ve talked to won’t even read Neitszche because he’s an athiest, and all they know of Christianity and Judaism is the retconned ‘Islam’ version Mohammed made in the Quran. Don’t drink the Blood of the KaliMa!